This vintage Zuni Indian silver turquoise snake eye three row cuff bracelet measures approximately 5-1/4" around the inside of the bracelet plus a 1" gap. 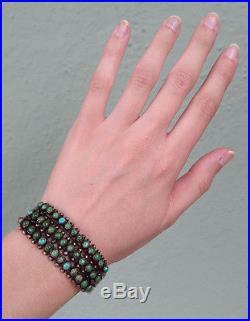 It has 39 Cerrillos green and blue turquoise stones. Measures approximately 7/8" in width and 7/16" on the ends. Like most older Native American jewelry, this piece is not stamped or hallmarked for silver content. It is sterling or a slightly lower grade of silver. 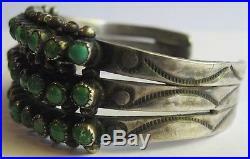 The item "VINTAGE ZUNI INDIAN SILVER THREE ROW SNAKE EYE TURQUOISE CUFF BRACELET" is in sale since Monday, May 09, 2016. This item is in the category "Jewelry & Watches\Ethnic, Regional & Tribal\Native American\Bracelets". The seller is "deja--voodoo" and is located in Santa Cruz, California.